The sinking of the RMS Titanic is a world renowned event. I was reared on the story either from local storytelling or the movie “A Night to Remember”. 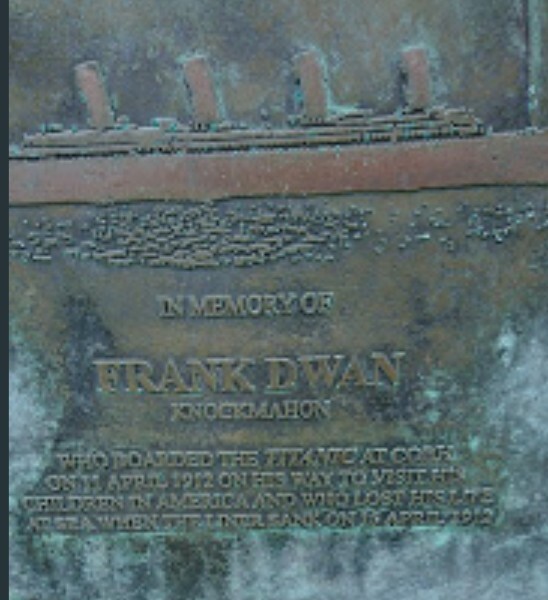 But it was only in recent years I even thought to research a local connection, when I came across a bronze memorial in Bunmahon to a man named Dwan who perished aboard. 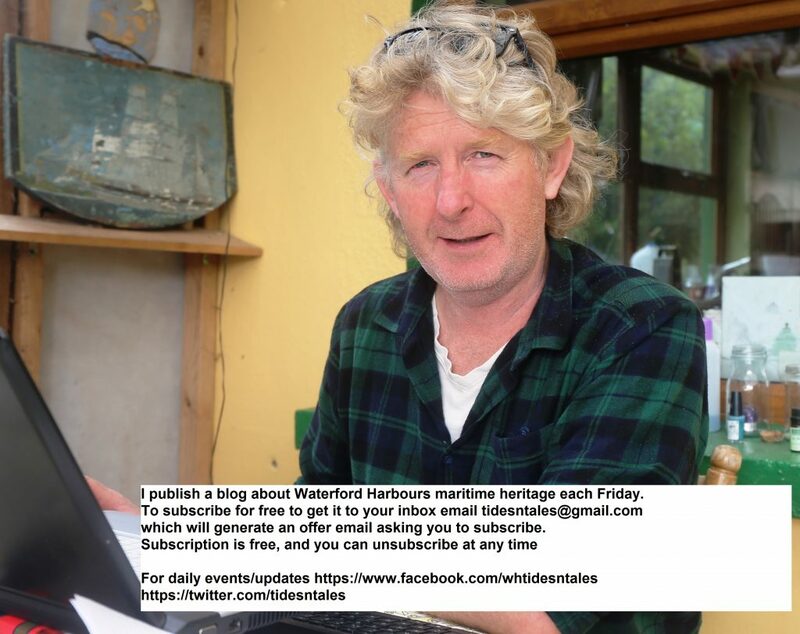 This coming Monday 15th, Waterford Civic Trust will honour another man who was aboard. His name was Patrick O’Keeffe, a passenger who not just survived, but also ensured several others were saved too. Titanic was built by the Harland and Wolff shipyard in Belfast for the White Star Line. She departed Southampton on her maiden voyage on 10th April 1912 calling to Cherbourg in France and Queenstown (now Cobh) in Cork before crossing the Atlantic towards New York. At 11.40pm on the night of the 14th April (about 375 miles south of Newfoundland), she hit an iceberg. 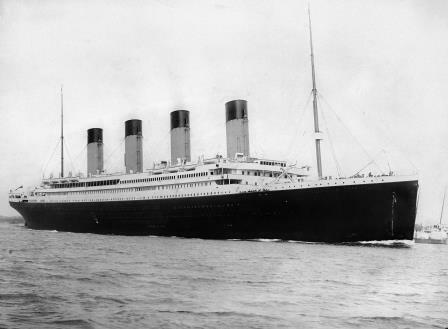 The “unsinkable” Titanic sank in a matter of hours. Of the estimated 2,224 passengers and crew aboard, more than 1,500 died. Patrick was born at Little Michael Street in Waterford City on 11th July 1890 to John O’Keeffe (a quarry labourer) and Catherine Fitzgerald Patrick was one of 9 known children. Patrick had returned to Ireland for a holiday, having first emigrated to USA in 1910 with his uncles. 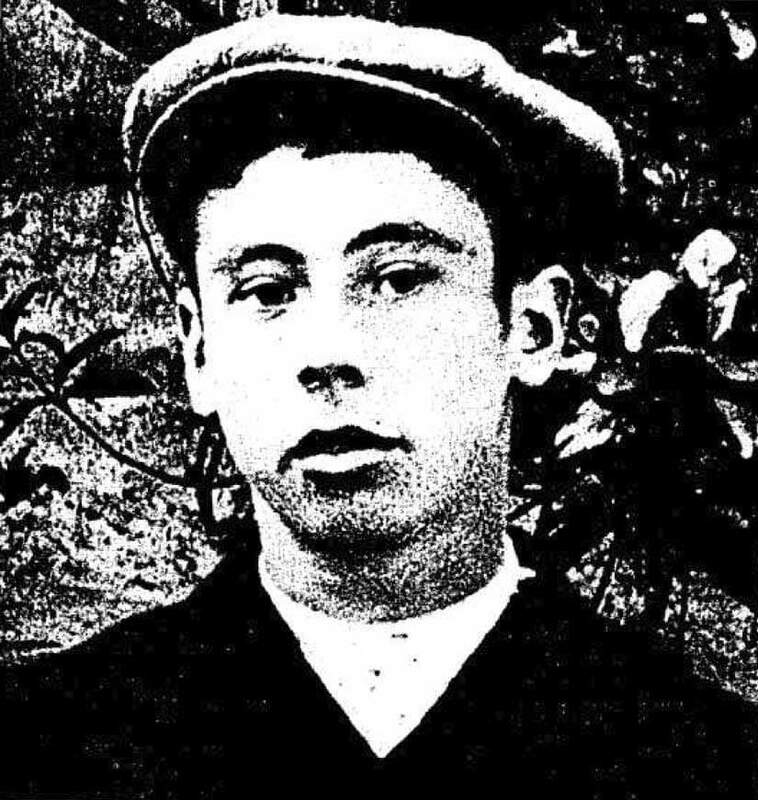 Apparently homesick, he had returned home for a month’s holiday in 1912 and had an earlier return sailing booked aboard the RMS Baltic; apparently his brother persuaded him to stay an extra week so they could spend Easter together as a family and his booking was transferred to Titanic. He boarded the Titanic at Queenstown as a third class passenger (his ticket cost £7, 15s as did all the 3rd class steerage passengers listed below). As the ship sank Patrick managed to make it to the steerage decks and he jumped into the freezing seas. Thanks to being a strong swimmer, he kept himself afloat, eventually pulling himself aboard the capsized collapsible B life raft. He managed to rescue several others from the water and they were later picked up by the SS Carpathia and landed at New York. He was a number of weeks convalescing having sustained heavy bruising. Frank (Francis) Dwan was born in Clogheen, Co Waterford, at the height of the famine in January 1847. A fisherman by trade Dwan, in the 1911 census was living with his wife at Knockmahon, Co Waterford. Several of Frank’s children lived in America and he decided to visit them in 1912, boarding the Titanic at Queenstown on a third class ticket. His destination was Morris Plains, New Jersey where his daughter Alice Murphy and son Michael and their families lived. He died in the sinking and his body, if recovered, was never identified. Duncannon Co. Wexford crewman. George Francis “Paddy” McGough was born in Duncannon in 1875. He signed on to the Titanic as an AB (Able Seaman) at Southampton on 6th April 1912. He was plucked from the freezing waters by lifeboat #9 and took the tiller and steered the boat. On the SS Carpathia coming into view he was credited with saying “Let us pray to God, for there is a ship on the horizon and it’s making for us.” He went back to sea for the rest of his working life and died in 1940. Community Notice. I’m happy to promote any event, subject to space, that is heritage focused and fits with the page mission to promote the maritime heritage of the three sister rivers and the harbour area. McElroy was living at Tullacanna (near Wellingtonbridge) in Co Wexford in the 1911 census but he was born in Liverpool and had spent his life at sea. He was put in charge of loading lifeboats as the ship went down. He was credited with keeping the loading in line and at one point discharged his pistol at two crew men who boarded a lifeboat and refused to make way. He went down with the ship, but his body was later recovered, identified and buried at sea. There were a few other Wexford souls aboard including Robert Mernagh, Passenger (28) from Ballyleigh, Ballywilliam, New Ross. Interestingly he was another who had returned on holidays and was heading back to America. He may have delayed his plans to travel, to await a relative from Bree Co Wexford; Elizabeth Doyle. Elizabeth was also returning to America, having come home to Ireland to nurse her ailing father. Both lost their lives. Another to die was crewman Laurence Doyle, fireman (27). Although his origins are unproven, he was thought to be from County Wexford. John O’Connor, Coal trimmer, Coolcotts, Wexford town, survived. I was told recently there may be another passenger from Dungarvan and a crew man that hailed from the Dunmore East area originally. At the time of going to print I have not enough info to commit anything to paper but who knows in time we might enlarge the list. Incidentally there are two other connections that spring to mind. The staircase in Loftus Hall on the Hook peninsula was said to be built by the same craftsmen that built the staircase aboard the Titanic. The other is another unproven anecdote. But in Cheekpoint I was told as a child that the Belfast shipyard that built the Titanic, actually considered locating in Waterford in the late 19th C based on the local skills base, and had surveyed a site in Cheekpoint near the Sheag Rock. Had that come to pass, perhaps the Titanic might have been built in Waterford! Unproven, by the author, as yet! On January 23rd 1645 one of the most surprising victories of any Irish action against the English was realised, when an Irish force managed to sink the flagship of the English parliamentary navy at Duncannon Co. Wexford. The ship was the Great Lewis and she lies to this day beneath the sands of Waterford Harbour. The background to this story lies in what is regularly called the Confederate Wars or in some cases the 11 years war 1641-1652. Although there were many aspects to this upheaval which would ultimately lead to a civil war in England and end in crushing defeat for the Irish under Cromwell, a key motivation of the catholic uprising sought to win concessions from the English king, Charles I, as a reward for supporting him against the English parliament. The Great Lewis and her three comrades via local marine artist Brian Cleare. With permission of the artist. In 1643 Charles I signed an uneasy truce with the Confederates in an effort to concentrate his efforts against Parliament. 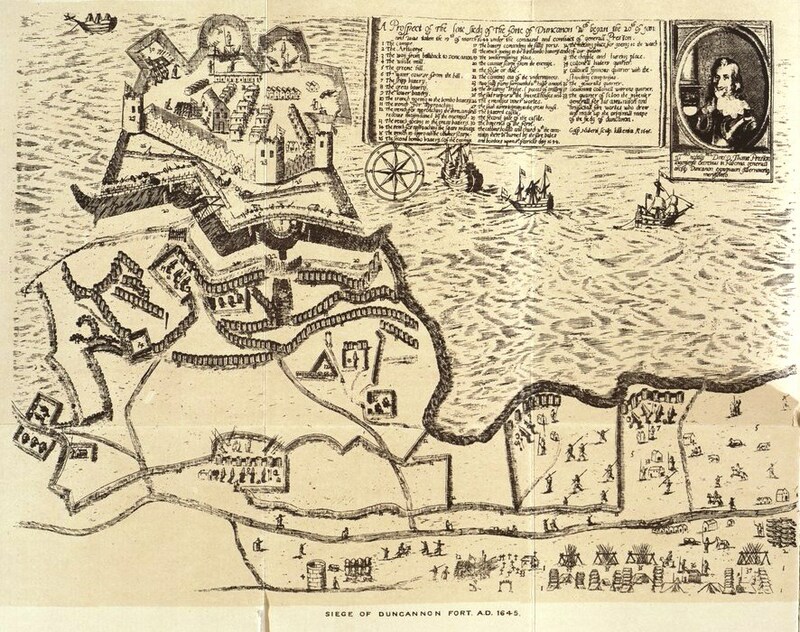 As is so often the case with civil wars alligencies chopped and changed and the troops stationed at Duncannon fort under Lord Lawrence Esmonde, initially loyal to the crown, decided to switch to the Parliament’s side. As the fort was of such strategic importance, the confederates dispatched troops from Waterford to attack it under General Thomas Preston, while from England, Parliament dispatched four ships to support it with additional troops and supplies. The flagship of this group of ships was a requisitioned merchantman, the Great Lewis. She was under the command of Captain Richard Swanley. The others were made up of the Madeline, (I’ve read elsewhere Mary and also Magdalen) Mayflower and Elizabeth. The command of the flotilla fell to a Captain Bell. 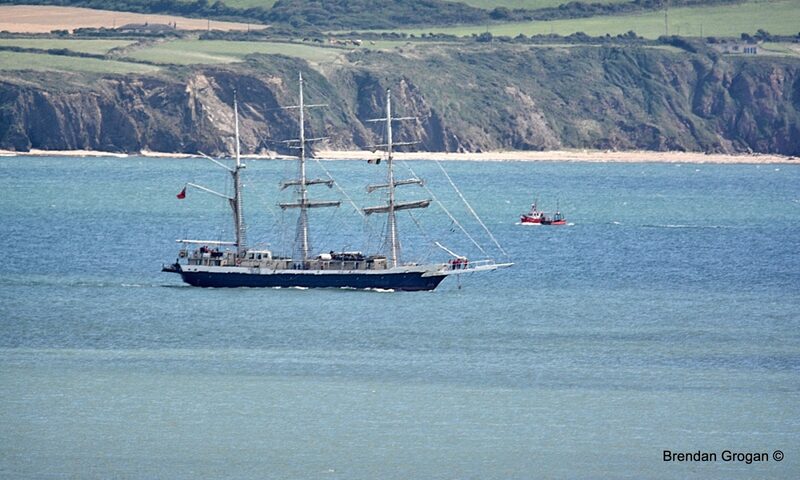 The Irish had an advantage of height over the four ships that were at anchor below them in Duncannon bay. During the night of the 22nd of January 1645 they moved their artillery to forward positions. As dawn broke on the 23rd they commenced firing upon the four ships, who realised they were in peril and prepared to make their escape. But fate was on the side of the Irish, or was it exceptionally good timing? For as the tidal and wind conditions were unfavourable, the ships found themselves at the mercy of the elements and the Irish cannon fire. The sailors did what they could to withdraw their ships out of range, the Great Lewis being severely damaged in the process. A sketch of the siege from Hore. 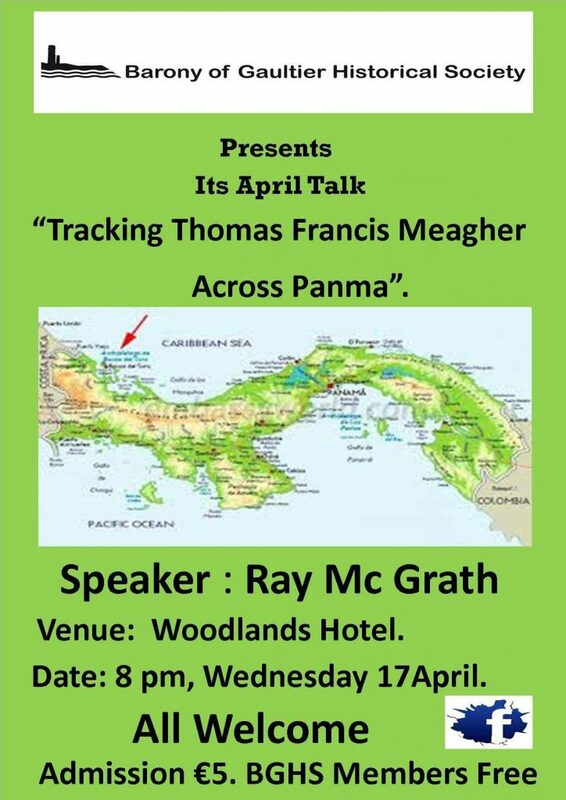 Via Wexford Co Library. With thanks to Michael Dempsey. With her masts damaged and her deck on fire the ship drifted slowly away from the onshore barrage, later to sink on the 26th, supposedly with the loss of 200 men (a figure I find difficult to understand in the circumstances). 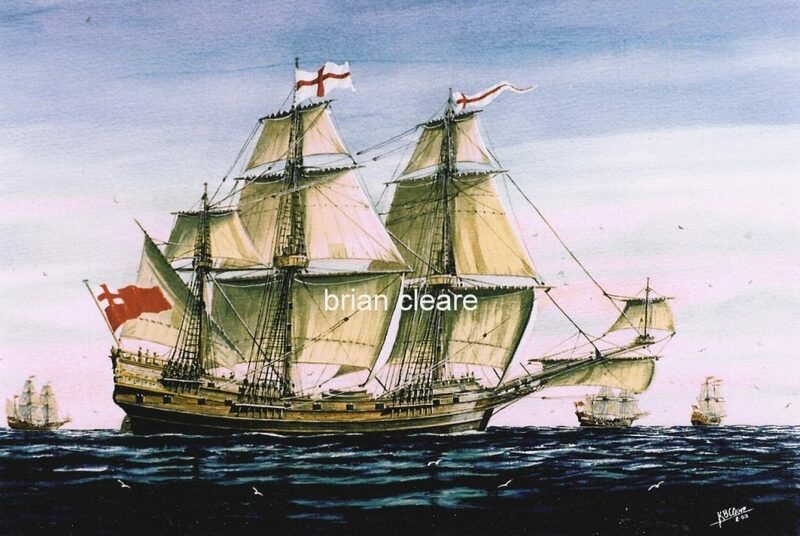 The other three ships escaped back to England once emergency repairs had been made. In 1999 when dredging works were being carried out by the Port of Waterford on this natural sand bar, timbers were uncovered which prompted archaeological monitoring. Subsequent underwater investigations discovered a 17th century wreck with canon sticking out of the sand. Perhaps predictably, given the little excavation work that has been carried out to date, it also expresses a word of caution “Though the historical evidence is plausible, further investigation is needed to determine the nature, extent and, if possible, the true identity of this wreck.” I guess in the graveyard of a thousand ships, its well to be cautious until a proper assessment can be made. The current level of investigation has only literally scratched the surface of the seabed. 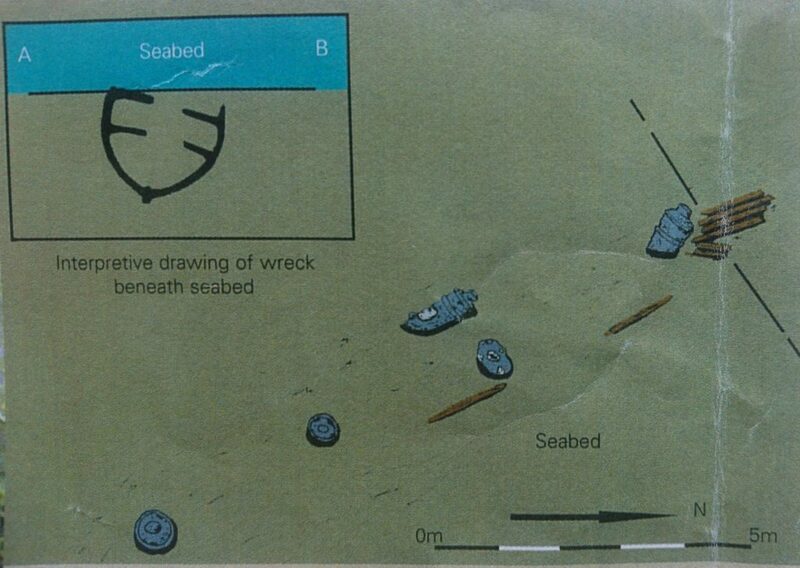 A sketch of the wreck lying off Duncannon, note the tiny fraction exposed. Nevertheless its importance nationally and internationally, even if not the Great Lewis, is undeniable. Both events were significant achievements for the confederate forces, and you can’t help but wonder when Cromwell finally reached Waterford harbour did he have a particular malice towards the area when he thought of the humiliation of the loss of his navy’s flagship and the taking of the fort. 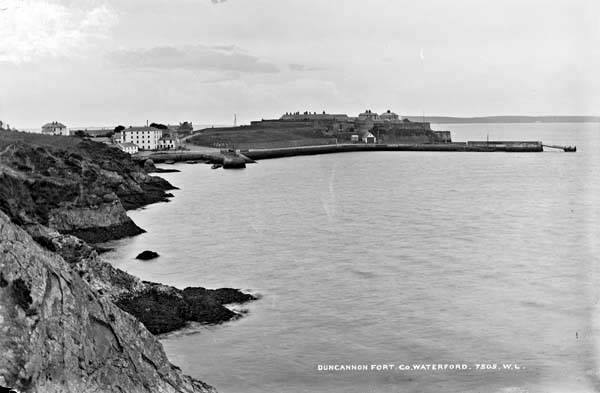 A previous guest blog by James Doherty gives a terrific insight to the era and specifically the activities pertaining to Duncannon Fort. 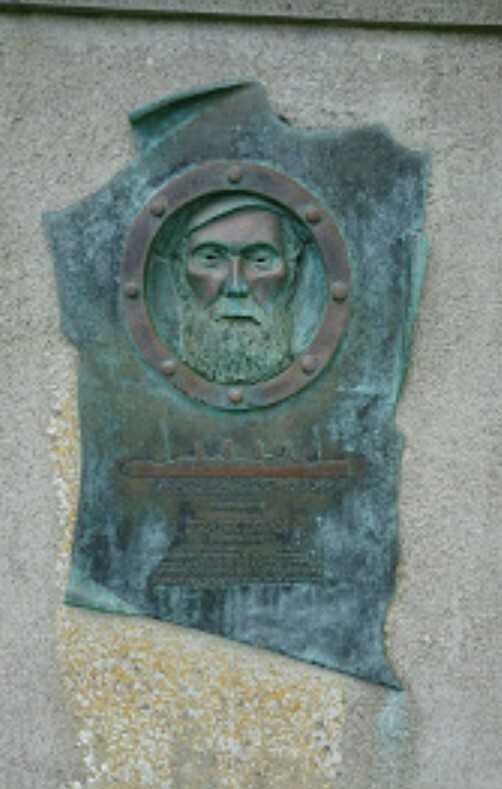 Next weeks blog looks forward to the Waterford Civic Trust event to acknowledge the anniversary of the sinking of the Titanic, the unveiling of a blue plaque to a survivor of the tragedy, Philip O’Keeffe. The blog will focus on his story, but also at least three others from the county, and three others from the harbour area.